Homemade Strawberry Shortcake reminds me of dessert from my childhood. 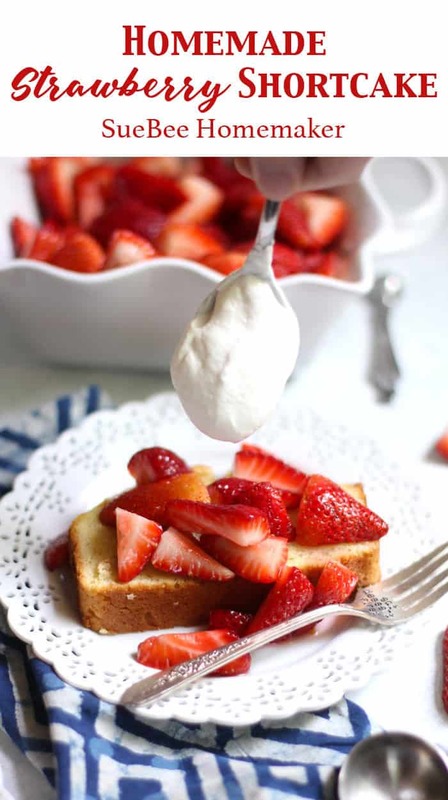 This recipe uses a simple vanilla poundcake plus sugared strawberries and some REAL whipping cream. How do you take your strawberry shortcake? Do you have childhood memories of this spring delicacy like I do? My mom made the BEST strawberry shortcake. Hers involved a Bisquick cake (remember that boxed mix?) using a recipe on the back, some sugared strawberries, and either cool whip or vanilla ice cream on top. It was a favorite dessert of mine, and I’ve been searching for my own version for years. This is it. My version. 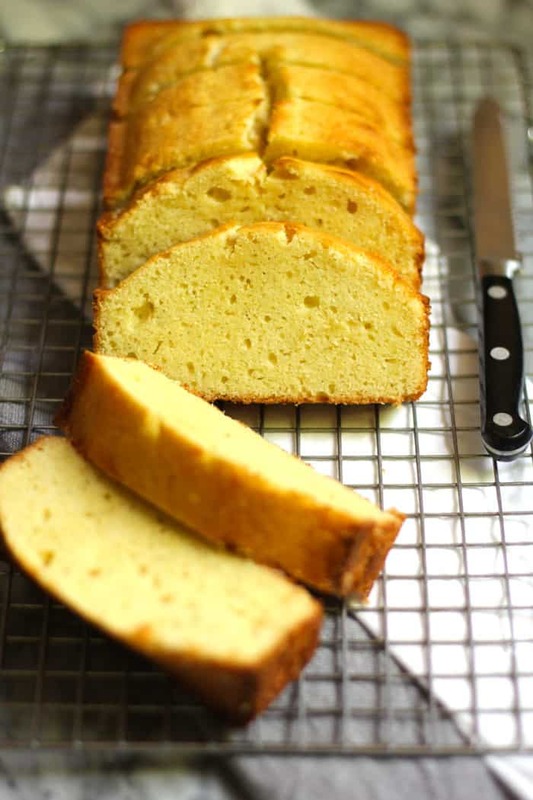 A classic pound cake is generally a pound each of butter, sugar, eggs, and flour – which makes two loafs. My recipe is for only one loaf, so I cut down the ingredients. I also subbed in four ounces of cream cheese for some of the butter, added some vanilla bean paste to up the flavor, and added a touch of salt and baking powder. I was inspired by Ina Garten on the Food Network, and this recipe is a spin on hers. 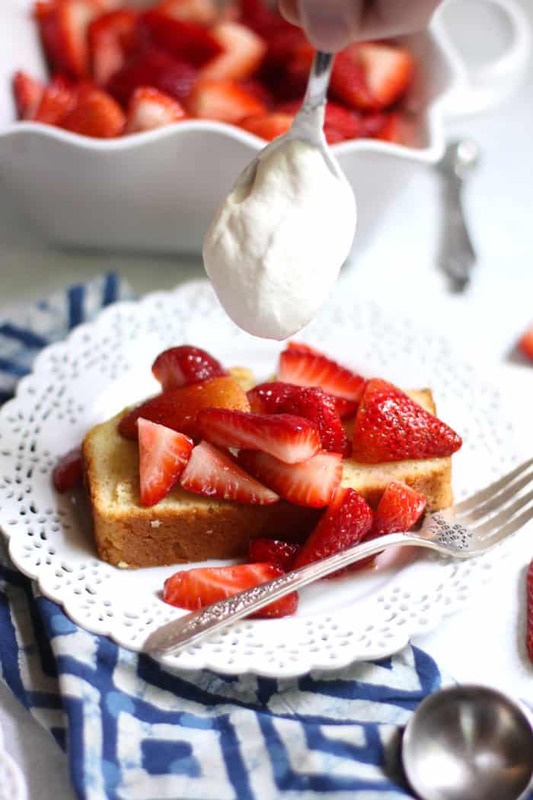 If you like a dense but moist base for your strawberry shortcake, this one’s it. When I was a kid, we’d stop at a strawberry farm and pick up huge boxes of freshly picked strawberries. Since they have a short shelf life, my mom would throw them in the sink with a bunch of water to clean them, and then she’d start hulling and slicing them for either jam or strawberry shortcake. There was always an overabundance after stopping at the strawberry farm, and I remember standing by mom eating them almost as fast as she cleaned them. Love this memory! If you can get your hands on some fresh berries from a farm, do that! Or just head to the grocery store and pick up some there, which is what I do here in Texas. 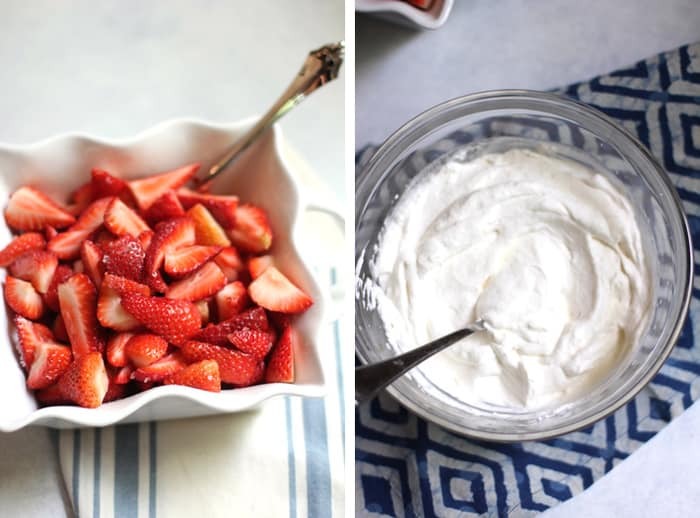 The key to preparing the strawberries for shortcake is the sugar. 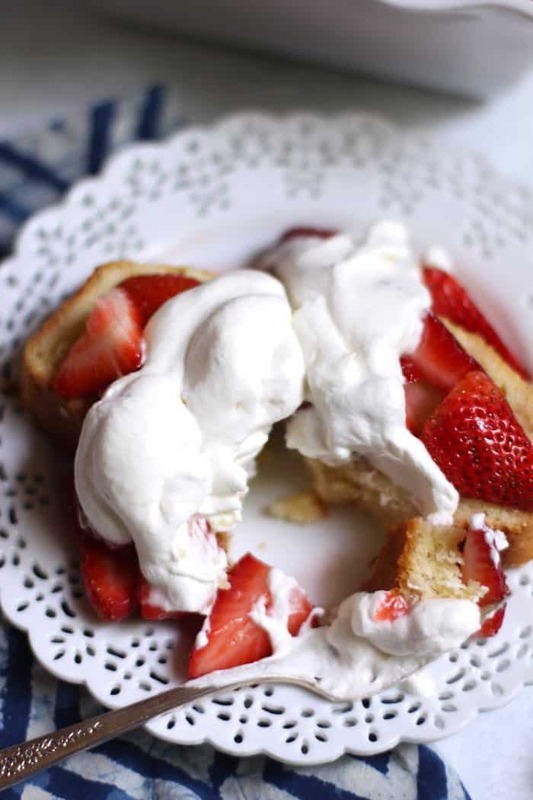 If you want a nice syrup-y drizzle on your shortcake, then add extra sugar to the strawberries. You can play with the amounts. Since the sugar draws out the juices from the strawberries, the longer you let them sit on the counter, the more juice you will get. Instead of using that packaged cool whip, make your own homemade version. It’s simple. Just whip these ingredients with a hand mixer, until it forms stiff peaks. Done and done, and the flavor beats the packaged stuff. 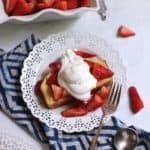 You can prepare all three parts to your Homemade Strawberry Shortcake a couple of hours in advance, and then just serve it up. I like to warm the sliced poundcake in the microwave so it’s nice and soft before adding the toppings. I’m also sharing tidbits of my life on Instagram. 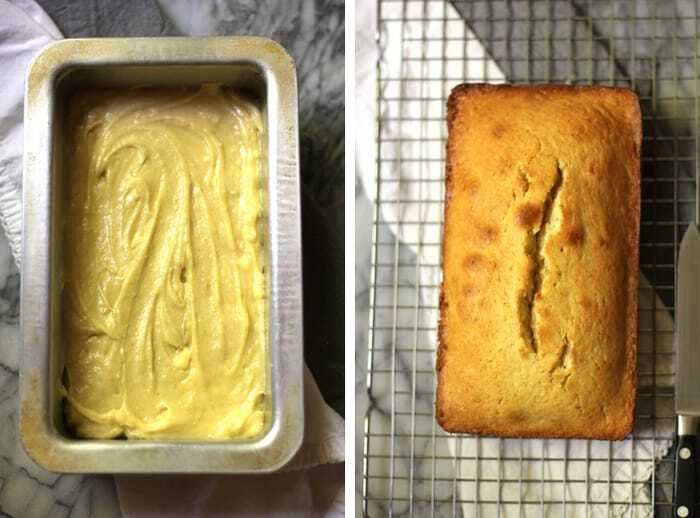 This simple pound cake is dense and moist, with a big hit of vanilla. 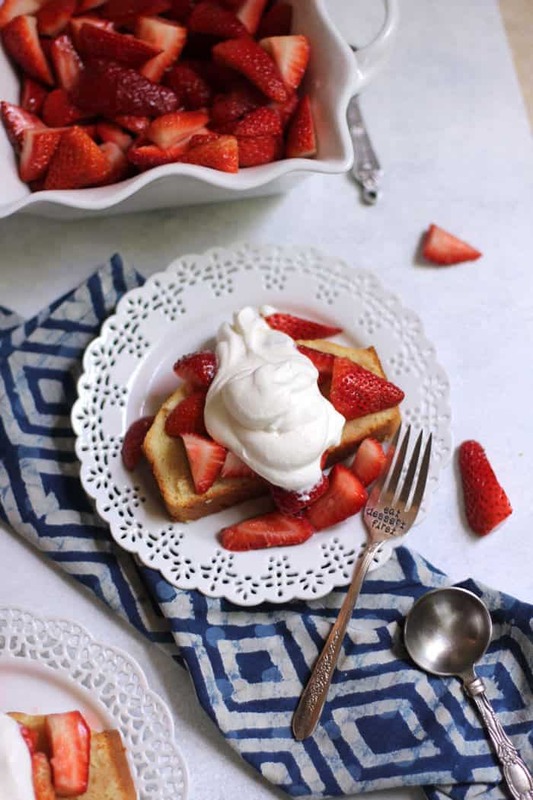 Serve it with strawberries and whipped cream for a delicious strawberry shortcake! Preheat oven to 350 degrees. Spray a loaf pan with baking spray. In a large standing mixer, whip the butter until creamy. Add cream cheese and sugar, and whip again. Slowly add in eggs, and continue mixing. Then add in vanilla bean paste, and whip again. In a separate mixing bowl, combine salt, baking powder, and flour. Slowly add to wet ingredients until just combined. Pour batter into prepared pan, smoothing out the top with a spoon. Bake for 50-60 minutes, or until a toothpick, when inserted in the middle, comes out clean. Transfer to a baking rack to cool. Clean the strawberries, hull, and slice in at least fourths. Place in mixing bowl, and add sugar. Stir. Let strawberries sit on counter for about 30 minutes. The sugared strawberries should form a juice on the bottom of the bowl. With a hand mixer, whip the heavy cream, powdered sugar, and vanilla until stiff peaks form. Place slices of pound cake on plates. Add scoops of strawberries along with a drizzle of the syrup-y liquid. Top with a dollop of whipping cream. When I was growing up my mom made that same cake from the back of the bisquick box! That’s awesome! Your pound cake looks delicious too! Brings back memories. A classic dessert and this one is amazing! So timely as we head into summer and fresh strawberries! Is it tooo much to put your Homemade Strawberry Ice Cream on the side?